A modular rodent for lefties and righties. You might already be using one of the options in our top picks for gaming mice, but if you're left handed, maybe not. Left-handed gamers don't have as many options as righties when it comes to gaming mice, that's just the way it is. However, Cooler Master opted to cater to both groups with its new MasterMouse Pro L, an ambidextrous gaming mouse that was "made with customization in mind." Other than being ambidextrous, what separates the MasterMouse Pro L from the pack is its modular design. It comes with two top panels of different lengths as well as two sets of magnetic side panels with different grip textures. That gives gamers a choice in grip style (palm and claw) and feel, and if the default options aren't enough, users can download a 3D printing file at no cost to print out their own side panels however they see fit. "This way, users can literally have a mouse all their own," Cooler Master says. Sitting inside the MasterMouse Pro L is a 32-bit ARM processor with 512KB of onboard memory for creating and storing up to five custom profiles. Once configured, you can plug the rodent into any PC and not have to fiddle with the settings all over again or revert by to the default configuration. Users can toggle the PixArt PMW3360 optical sensor between four levels of DPI ranging from 400 to 12,000. There's no interpolation and no acceleration. "MasterMouse Pro L doesn't estimate your moves. It tracks them in real time," Cooler Master added. Other specs include a lift-off distance of around 2mm, which is adjustable, along with a tracking speed of 200 ips (50g) and a 1,000Hz/1ms polling rate. The mouse comes standard with eight programmable buttons using Omron switches. You can expand these up to 14+1 by enabling secondary functions. Finally, there are programmable illumination zones for the scroll wheel, back beam, and both front sides. Users can customize the lighting scheme with 16.7 million color options and various effects. 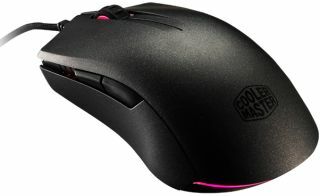 The MasterMouse Pro L should be available today on Cooler Master's online store for $60.